Would you like to see your students use expanded and precise words more often? Help them go beyond "big" with a fun synonym and antonym worksheet puzzle* that will really make them think! A word search puzzle is perfect for when you want a reward, morning warm up, a bell-ringer, or something for your early-finishers. 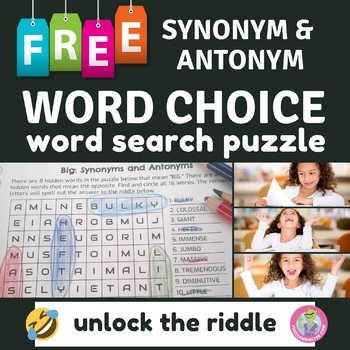 This is more than just a word choice worksheet, more than just synonym and antonym worksheet - even more than a word search puzzle. It's a combination of all of the above - plus a punny riddle to solve (yes, "punny" :) ). It's a word search with a word bank of words to find. The words are synonyms and antonyms of the word "big". *All our puzzles are made by hand. We never use an automatic word search maker because word search puzzles are better when they are handmade --- more challenging, better layout of hidden words, and in general quality. Get the larger resource for more puzzles and Common Core alignment! ★♥♥♥♥★ Click here to get our larger pack of puzzles with more words! Stay in touch, get freebies! ★Click to Follow Me to get our awesome freebies and updates on new teaching resources! After you download these word choice worksheet and you get a chance to ♥♥♥♥ them, please share your feedback! 1. Go to your "My Purchases" page (you may need to login first). 2. Click on the "Provide Feedback" button next to your purchased resource. 3. You will be redirected to a page where you give a star rating and leave short feedback. Each time you give feedback for a paid item, TpT gives you credits!